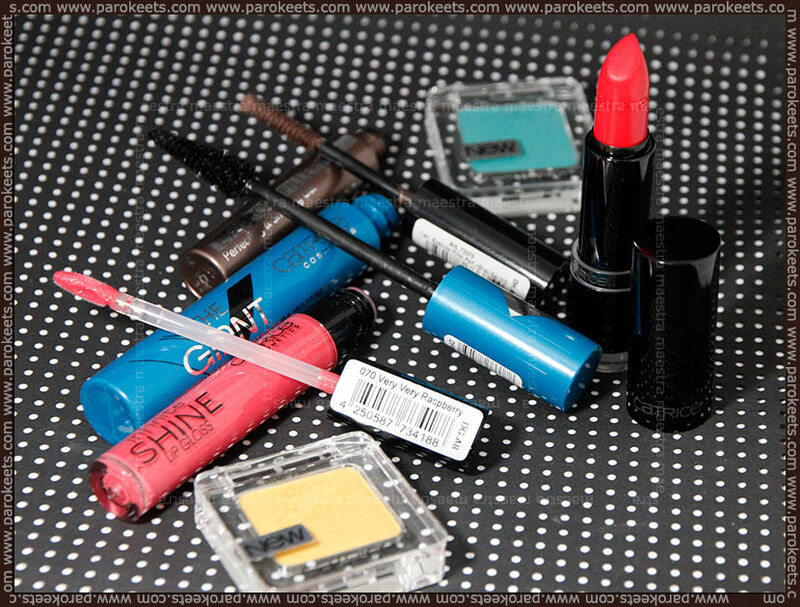 Catrice is bringing new products out for Spring and Summer 2013. This is my review about some of the new products. Naturally tinted Eyebrow gel, suitable for eyebrow colors. The fibers fill in small gaps – for dense and perfectly shaped eyebrows within seconds. I’ve never had a product like this, so I was very excited to try it. At first I was disappointed. It hardly did anything to my eyebrows. After a while I got used to it and now I like it a lot and use it almost every day. What did I do wrong in the beginning? I probably just didn’t put enough product on my eyebrows. I was afraid that I would put on too much and so I ended putting on too little. After I realized that it is not as pigmented as I thought it would be, everything was fine. Now I really like the product. I just wish it would hold in place my eyebrows better. And a big down side to this product is that there is only one color available. Extreme volume that lasts all day. 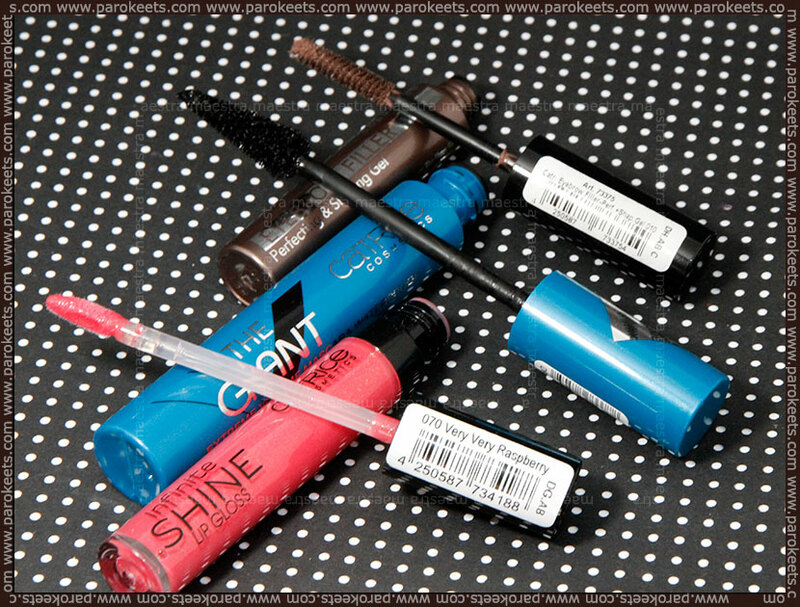 “The Giant” Waterproof Mascara delivers a stunning look with bold and dramatic lashes. Thanks to the specially shaped XXL-brush, every single lash from the inner to the outer corner can be reached easily. Easy to remove with waterproof make-up remover. Ophthalmologically tested. Let’s got straight to the point. I do not like this mascara. I think that the wand (XXL-brush) is weird and it makes the application of the product harder (not easier). I just didn’t get used to it. Yes, it is easy to get into the inner and outer corners with the thin side of the wand, but what about the really big side. I just do not get it. And the worst part is, they promise you “stunning look with bold and dramatic lashes”. Well, it didn’t happen to me (see the make up photos). I get more drama to my lashes with only one coat of my beloved mascara than I got with three thick coats of this mascara. The mascara (or the wand) separates the lashes nicely. The lashes do not get clumped even after three coats. It is one of those dry mascaras. Lip Gloss for spectacular shine. Keeps lips smooth and intensely moisturized. Non-sticky. This is a beautiful and bold red matt lipstick. I love it! 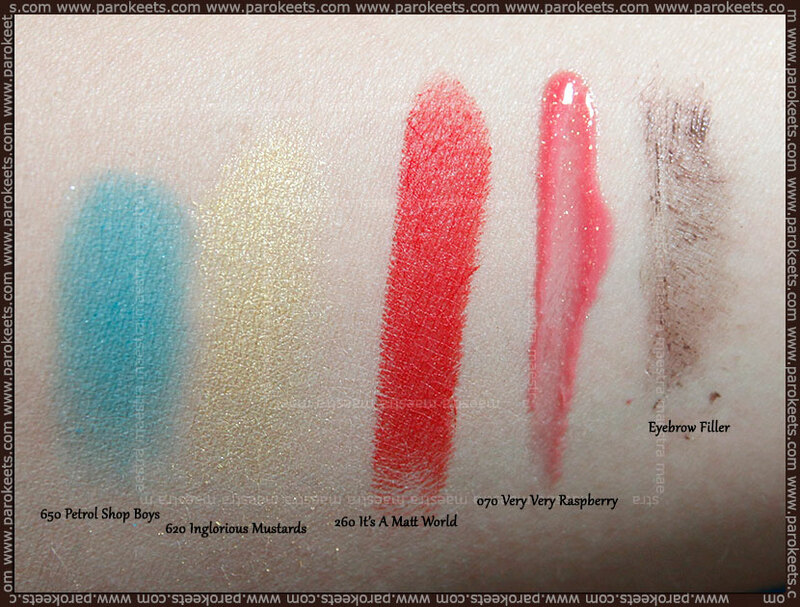 The pigmentation is great (see the swatch photo – only one swipe). It is long lasting. It doesn’t really dry the lips out. I mean … yes, the feel on the lips is dry but not drying. If this makes sense. Very lovely lipstick. Both of the eye shadows are very pigmented. Both are a bit too powdery for my liking. I love the gold one (Inglorious Mustards). It gives just the perfect amount of shine if used without the eyeshadow base. I was disappointed by the turquoise one (Petrol Shop Boys). The pigmentation is great when you first apply it, but it fades quickly. By quickly I mean like after a couple of minutes. I think it is because the product is very powdery. It is almost impossible to layer it, because the top layers just disappear after a while. 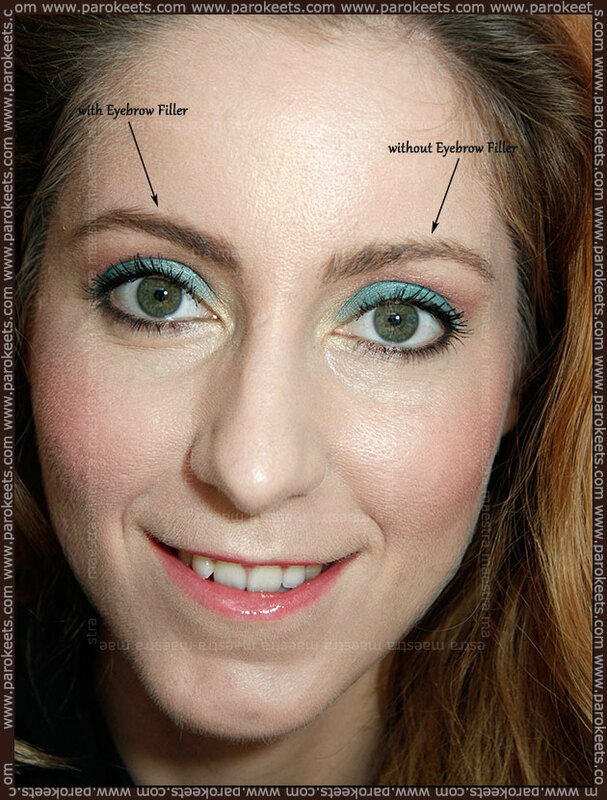 While I recommend the gold eyeshadow, I do not recommend buying the turquoise one although it is a beautiful shade. Here is the make up I did with the new products I got for review. If you’d like to found out more about some other new products, Gejba posted a video review a while ago. HERE is the link to her post. Now I am curious … Did you already try any of new products by Catrice? Which ones are your favorites? And were you disappointed by any of the products? O, eyebrow filler se bere zelo fino, čeprav zaenkrat še zmeraj prisegam na Essence senčko za obrvi. :) Bi lahko morda prosila za primerjavo rdeče mat šminke z ostalimi iz tvojega arsenala? Morda z Manhattan lip cream 45H, če jo imaš? Mimogrede, imajo več mat šmink zdaj v novi kolekciji? Me že mikajo!